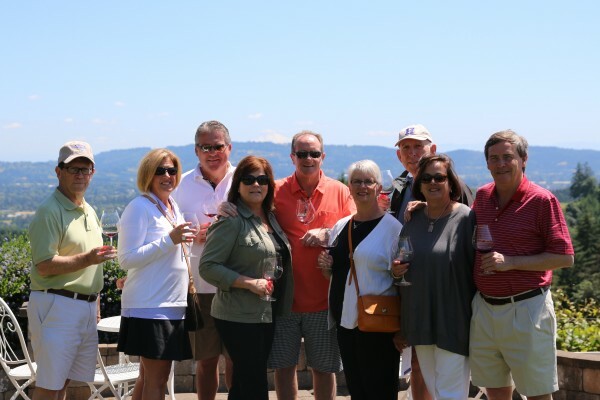 DUNDEE HILLS, Oregon – There is a strong sense of responsibility bringing guests, paying you, to visit select great wineries. And I’ll have to admit I had some nerves yesterday before my four couples from Indianapolis, Massachusetts, and Iowa arrived. Members of our group tasting Jesse Lange’s three soil series Pinots. But the wow factor today and the great start in the Willamette Valley could not have been any better. Literally months of planning went into crafting a four-day, five night wine trip that offered the familiar and the new, the attainable and the not-so-attainable, and some big wow factor. We got all of that in two wine stops on day one. We spent the bulk of our day at Lange Estate Winery. We walked the vineyards and spent extensive time with Jesse Lange’s assistant winemaker Neil Larson in the winery. Neil walked everyone through the winemaking process and answered some really good questions from the tour participants. WE tasted the unique Lange oaked Pinot Gris, the Chardonnay and the full lineup of Pinot Noir. Jesse Lange had to be out of town today so he had the delightful Monique pour his 2012 soil series of three different Pinots from three different soil types. The group seemed to really enjoy evaluating the different wines and quizzing each other why they liked one more than the other. It was one of the highlights of the day for me. The other two highlights was an awesome lunch of meats, nuts, cheese, salad, and sandwiches from Red Hills Market. The topper was a clear sky and the appearance of MT. Hood from the Lange patio. It was the first time the mountain was visible in my four different Lange visits. 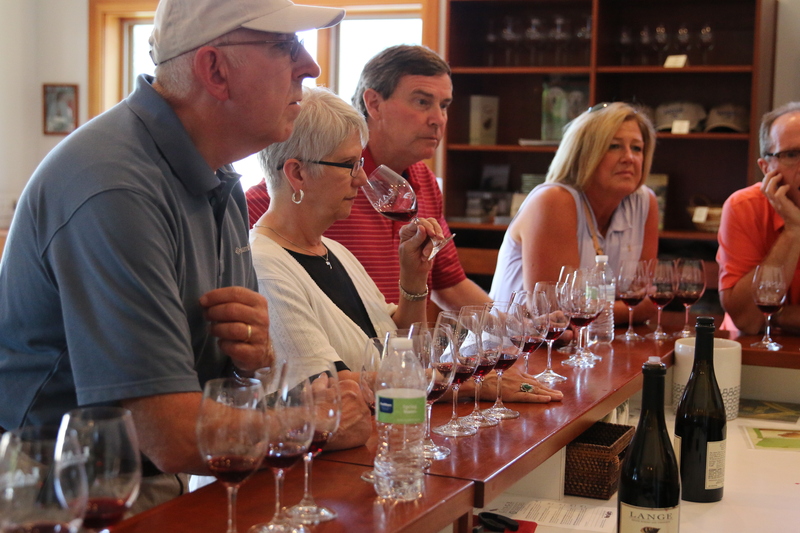 The group bought club memberships, individual bottles, cases, and headed off a happy group of wine drinkers. Our other stop today was at the much newer Alexana Winery. The incredible vineyard property and ultra modern tasting room and winery made for a great tour. Sales Manager Mark Bosko led a portion of our tour but winemaker Bryan Weil walked us through the winemaking and the outdoor tasting. The wines were really stunning. It was definitely, for my palate, wines meant to be taken home and put away for awhile. From the ultra dry Reisling to the silky Pinot Noir we were all impressed. We had several comparative choices to make and the big winner was a three lot 100 percent Pommard clone Pinot that blew us all away. The wine is a collaboration between Weil and consultant winemaker Lynn Penner-Ash. The bottle is not cheap at $75 but definitely a great representation of Oregon Pinot at the price point. Wednesday is our really big wine day with four stops. Blogger Note: I’m taking lots of photos but will not get most up until after the trip. It’s just too difficult on a travel laptop and the time constraints of being the tour leader. I have some great stuff and try to get a few up each day. Many have simply been iPhone shots.